Dust devils are spinning, columnar vortices of wind that move across a landscape, pick up dust, and look somewhat like miniature tornadoes. They most commonly occur on warm, dry, nearly windless days; but they can also sometimes occur in association with a passing storm front. Dust devils are a very common occurrence on Mars. Between 15 September 1997 and 21 January 2006, the Mars Global Surveyor (MGS) Mars Orbiter Camera (MOC) imaged more than 11,455 active dust devils occurring in the martian afternoon between about 1 and 3 p.m. local time. Dust devils were seen at nearly all latitudes, from 72°S to 62°N, and streaks created on the ground by passing dust devils were observed from 80°S to north of 80°N. The MGS MOC and later the Mars Reconnaissance Orbiter (MRO) Context Imager (CTX) continued observing dust devil activity through 2006, and CTX continues to watch for new dust devils every day in 2007. Active dust devils have been observed to occur in both the northern and southern hemispheres during all seasons of the year. Most dust devils occur in mid-summer in each hemisphere. The largest dust devils, towering more than 8 kilometers (5 miles) into the sky (e.g., Wind Action--The Dust Devils of Amazonis Planitia), occur in northern Amazonis Planitia, in a region near Syria Planum and Claritas Fossae, and immediately west of Schiaparelli Basin. Contrary to a belief that was common in the Mars science community before the MGS mission, dust devils do not give rise to dust storms. In fact, when dust storms are raging, dust devils are much, much less common, especially during the dustiest times of the martian year. The pictures presented here summarize some of the observations of dust devils obtained in recent years by the MGS MOC and MRO CTX, and by the Viking 1 orbiter nearly 30 years ago. This MGS MOC image shows streamers of dust being lifted from the ground and rotating around a low pressure center to form a large dust devil in the Syria/Claritas region of Mars. This picture was acquired by MOC on 31 October 2004 near 15.2°S, 108.2°W. Sunlight illuminates the scene from the upper left and north is toward the top/upper right. By knowing the elevation of the sun above the local horizon, the direction from which the sun was shining, and by measuring the length of the shadow cast by this dusty vortex, MOC scientists estimated that the dust devil at this stage of formation had reached a height of about 400 meters (~1,300 feet) above the surface. The streamers indicate that the winds in this vortex were spinning in a clockwise direction. Observations of many thousands of dust devils on Earth has demonstrated that dust devils, which are very short duration events, are not impacted by the Coriolis effect; they do not spin one way in the northern hemisphere and the other way in the southern hemisphere. MGS MOC images acquired over the past four martian years showed that hundreds of dust devils form each afternoon in northern Amazonis Planitia during the spring and summer seasons. These particular dust devils show up each year like clockwork, beginning around the start of spring and ending just after autumn arrives. The MRO CTX picked up the task of monitoring northern Amazonis dust devil activity where the MGS MOC left off. Communication with MGS was lost just days before the MRO Primary Mission began in early November 2006. From that point forward, whenever possible, the CTX team has acquired images of 30 kilometers (18.6 miles) width, some of them several hundred kilometers long, covering the areas of known dust devil activity. Also, the team has used Mars Color Imager (MARCI) daily global observations at roughly 1 km/pixel scale to monitor this area for the very largest dust devils, whenever the viewing geometry permits. This MRO CTX image shows a portion of the survey region in northwestern Amazonis as it appeared around 3 p.m. local time (on the ground) on 23 November 2006. The image center is near 36.5°N, 157.1°W, and sunlight illuminates the map-projected scene from the left/lower left. More than a dozen dust devils, of various sizes, are seen—all occurring at the same time! The dark shadows of these dust devils indicate that the larger ones tower several kilometers into the sky. North is up. Dust devils commonly, although not always, create a streak on the ground as they pass over and disrupt fine coatings of dust on the surface. This MGS MOC image shows hundreds of crisscrossing dark streaks created by individual dust devils. The image also shows a suite of linear, parallel streaks formed not by dust devils, but by wind gusts. These features are located on Malea Planum near 67.2°S, 316.2°W. They were imaged by MOC during southern summer on 26 November 2003, with sunlight illuminating the scene from the upper left. North is toward the top/upper right. This is a portion of a MGS MOC red wide angle camera image of terrain in the Noachis Terra region of Mars, as it appeared on 8 May 1999. At the time, winds were blowing across the region from the northwest, raising dust from the ground to form dust plumes, a dust storm, and near the north margin of the windy area, a dust devil. This image captures, in one moment of time, the full array of the types of dust-raising events that occur on the red planet. Over the course of the 1997–2006 MGS mission, the MOC team observed that dust is raised somewhere on the planet nearly every day. In this image, north is toward the top/upper right and sunlight illuminates the terrain from the upper left. This picture shows two views that were acquired simultaneously by the MGS MOC on 28 December 2002. The top view is a portion of a red wide angle camera context frame; the white box shows the location of the lower image, a narrow angle camera image of a single large dust devil in northern Amazonis Planitia. The context frame shows that several other large dust devils were occurring at the same time. The narrow angle image is labeled to indicate key features, including a streak created on the surface as the dust devil traveled from the upper left (northwest) toward the lower right (southeast). The dust devil's shadow shows the tight, narrow vortex and a larger plume of dust at higher altitude above the vortex. The shadow also shows that the dust devil was bent by wind shear between points A and B. Because the angle that sunlight was impinging on the dust devil is known, the shadow can be used to measure the height and key features in the dust devil. The kink at A is about 0.64 km (2100 feet) above the surface, the bend at B is about 1.24 km (4070 ft) altitude, point C is at 1.68 km (5510 ft), and the top of the dust plume is near 2.82 km (9250 ft). On 1 August 1978, the two cameras of the Viking 1 orbiter's imaging system acquired overlapping pictures of a region in Syria/Sinai that showed a light-toned columnar feature casting a shadow toward the southeast (lower right). The two images, 755A10 and 755A11, were obtained just 15 seconds apart. During that time, the bright feature and its shadow changed. The feature was a dust devil, and the Viking cameras caught it in motion. Nearly three decades later, the MGS MOC acquired an image on 22 March 2005 of the area, with the ephemeral dust devil long, long gone. During the 15 second interval between the two Viking 1 images, the dust devil moved toward the northeast (upper right) at a rate of about 18 meters (59 feet) per second. Sunlight illuminates all of the images from the upper left; north is up. A full report about dust devils observed by the MGS MOC, containing 32 figures, was recently published by Bruce A. Cantor, Katherine M. Kanak, and Kenneth S. Edgett (2006, Mars Orbiter Camera observations of martian dust devils and their tracks (September 1997 to January 2006) and evaluation of theoretical vortex models, Journal of Geophysical Research, 111, E12002, doi:10.1029/2006JE002700). Additional images of dust devils and dust devil streaks acquired by MGS MOC can be seen here: Dust Devils. Malin, M. C., B. 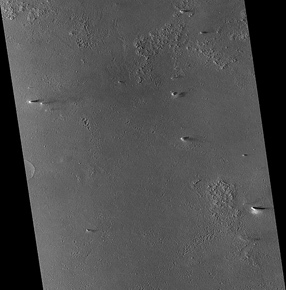 A. Cantor, and K. S. Edgett (2007), MRO, MGS, and Viking views of Martian dust devils, Malin Space Science Systems Captioned Image Release, MSSS-1, http://www.msss.com/msss_images/2007/02/12/. Malin Space Science Systems (MSSS) built and operates the Mars Reconnaissance Orbiter (MRO) Mars Color Imager (MARCI) and Context Camera (CTX). MSSS also built and operated the Mars Global Surveyor (MGS) Mars Orbiter Camera (MOC). In addition, MSSS built the Mars Odyssey (ODY) Thermal Emission Imaging Spectrometer (THEMIS) Visible (VIS) camera subsystem, which shares optics with the thermal infrared instrument and is operated at Arizona State University (ASU). MSSS built the Mars Descent Imager (MARDI) for the Phoenix Mars Scout lander and in 2007 is designing and building camera systems for the Mars Science Laboratory (MSL) rover mission, the Lunar Reconnaissance Orbiter (LRO), and the Juno mission to Jupiter.